Antifriction bearings minimize friction by removing any possible sliding between bearing surfaces and replacing all contacts with rolling interfaces. 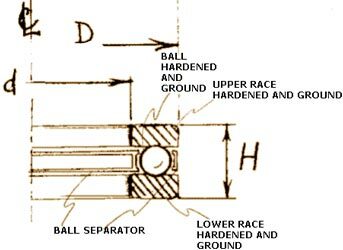 They substitute balls or rollers for a hydrodynamic or hydrostatic fluid film to carry loads with reduced friction. They utilize a separator to space the hardened rolling elements apart. The Anti-Friction Bearing Manufacturers Association Standards (AFBMA) provides standardized dimensions, tolerances and fits of ball and roller bearings. Antifriction bearings can be categorized to three different configurations: axial ball, roller and thrust bearings. They are more desirable than plain bearing due to their lower friction and reduced lubrication requirement. However, the life of antifriction bearing is limited by the fatigue life of the material they are made of and the type of lubricant being used. The types of antifriction bearing are group by the shape of the rolling element and they are ball bearings, cylindrical roller bearings, tapered roller bearings, and needle roller bearings. There are variations within each type of bearings and only the most commonly used ones are discussed below.